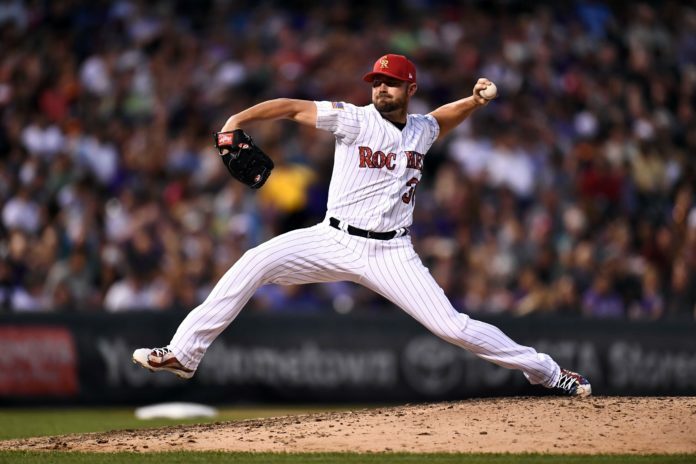 The travesty that was the Colorado Rockies starting rotation turned a corner last year. 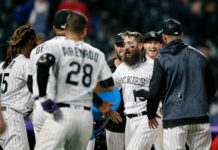 As a team, Bud Black’s staff delivered the fourth-lowest earned run average in franchise history, subsequently resulting in the fourth-most innings per game in the league from their starters. While the rotation shined, the bullpen for the club once again faltered, despite a large sum allotted to fixing their woes in free agency. Prior to the year, Jeff Bridich doled out $106 million between Jake Mcgee, Bryan Shaw and the most notable acquisition, Wade Davis. While Davis accrued a National League-leading 43 saves, the former two struggled. For the Rockies to compete this year, the bullpen needs a juxtaposition of its current course, led by changes among four of their elder relief arms. While with the Cleveland Indians, Shaw was a setup man for closer Cody Allen. After the acquisition of Davis, Shaw’s role was set to be the same last year. Instead, the call for Shaw from the Rockies’ bullpen was unpredictable. In 54.2 innings, Shaw registered a 5.93 ERA with a career-high nine home runs allowed. The real problem for the veteran was his lack of command. Shaw’s absence of control led to a career-high 4.61 walks per nine innings, a far cry from his average of 3.0 with the Tribe. The right-hander also threw 401 balls outside the zone. With only 1015 pitches thrown, the ball-to-strike ratio for Shaw was the highest of his career. Due to his woes, Shaw also allowed a 39.1-percent hard-hit rate, an apex mark for his eight-year career. With all of the career-high marks last year, the forgettable season could be chalked up as an anomaly if reversed. With his velocity remaining stagnant, Shaw’s mechanics likely need a small tweak, rather than wholesale changes. As the seventh-highest-paid player on the club’s payroll, there’s a lot riding on a bounce-back year. In the era of fireballers, McGee chose a different path last year, as his velocity regressed to 94.2 miles per hour, the second-lowest of his career. Whether it was a choice or merely a slight deterioration of his arm, the impact was notable. When McGee was in his prime, his fastball had zip, with a career-high average of 97.5 MPH in 2014 to show for it. With his most-used pitch working, McGee tallied four respective years under a 3.61 ERA, not including his eight-game rookie stint. In all four of those years, McGee averaged over 95 MPH on his fastball. While the heyday of McGee’s fastball may have passed him by, replenishing his velocity is one of the few things that can aid his calamities. The radar gun lit up for the best portions of McGee’s career, enabling his dismissal of nearly every right-handed hitter he faced. While Spring Training results don’t always equate to regular season success, McGee’s double-digit ERA in Arizona yields little comfort. Of the four candidates seeking change in 2019, Dunn is the one that evades the trend. The only problem for the former Miami Marlin hurler was an aching shoulder, an ailment that resulted in his season being cut short. In limited appearances last year, battling his injuries, Dunn still had success. An outlandish 9.00 ERA notwithstanding, the southpaw had 17 separate appearances without allowing an earned run. The bloating came from a four-run appearance against the Los Angeles Dodgers without accounting for a single out. Without that showing, Dunn’s ERA drops to a more manageable 6.88. 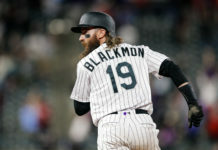 While the former is still high, the Rockies are hopeful that a reliever that ceded zero runs in 68 percent of his appearances, with an ability to heighten that ratio with a clean bill of health, can register even greater numbers. Those roadblocks in the training room have been a thing of the past in Spring Training thus far as Dunn has allowed zero runs in his eight appearances and only three hits. Dunn looks to be ready to rebound if his shoulder does the same. In the last two years, Chris Rusin has showcased both the makings of a superstar long reliever and merely a lackluster innings eater. The latter occurred last year as Rusin returned from an early-season injury, only to pitch to the tune of a 6.09 ERA in 49 appearances. In 2017, those results were foreign as he accumulated 85 innings in 60 appearances, all while boasting a 2.65 ERA. Amongst his troubles, Rusin allowed 43.4 percent of his runners to score, allowing 82 out of his 241 hitters faced to reach base. The key to Rusin returning to his 2017 form is to avoid the snowball effect. He stranded 78.2 percent of hitters that reached base in his dominant campaign, with his small mistakes remaining isolated instead of common. A large change for Rusin was the use of his changeup, a key part of his 2017 repertoire. After utilizing it 26.9 percent of the time two years ago, it’s usage fell to 17 percent, with the value of the pitch plummeting as well. As a pitcher that relies heavily on his fastball, the changeup is an excellent source of groundballs and getting hitters out front. If hitters are off balance, the runners that reach base against Rusin will fall prey to groundballs far more often, allowing the Rockies’ Gold Glove defense behind him to operate. With a back injury hampering his Spring Training stint this year already, the odds of him returning to his previous form are slimming, but still possible.